If articles and essays I have been reading in the past year indicate a pattern, then Bible-believing Christians in America need to wake up to the fact that they are soon to become a targeted minority by the very culture and political structure that they surrendered to the Left over the last few decades. It is no surprise to me, understanding the intentions of our Founders, the role that Christianity was to play in keeping our liberties and this republic from falling into the same ruin every republic that preceded us fell into. As Evangelical and Bible-believing Christians shrink from active roles in both the cultural and political landscape – the neo-religious and secular Left is filling the void left behind with every abomination to both religion and liberty. Socialism is replacing individual liberty and faith in God in this country. Government is now being seen as our Lord and Master in every way imaginable. Politicians are being heralded as messiahs and promoting ‘change’, that the worshipping masses praise, whereupon close inspection beyond the rhetoric reveals the worst possible kind of change for a former free republic; a politburo elite ruling over a starving mass of serfs made slaves to serve an all-powerful and all-seeing government. Christ will no longer be Lord in such a society as we are devolving into – as history demonstrates time and again that human nature in governmental power will suffer no rivals of allegiance. The rails are already being greased for the masses to accept the denunciation and persecution of Biblical Christians, with all kinds of works from the Left that depict fundamental Conservative Christianity as the largest threat to mankind and the nation in matters of tolerance, race, fairness and even belief itself. We of course did not arrive here overnight, and our cultural decay and political circus of today is being made possible by the failings of the American Christian church to remain active, vigilant, steadfast and resolute in the face of the attacks by the political and cultural Left. Instead the church has either ignored these assaults on liberty, or compromised with the promotion of sin and vice as a legitimate choice that one should never judge. This political season is just a testament to the fact that Christians in America have surrendered their God-given liberties and abandoned the battlefield of principles and ideas to a ravenous Socialist juggernaut. Of course, even among the ‘Moderate Left” – they too have now picked up on the retreating Evangelical Christian as a political force and culture guardian. Ah, spring. Fresh flowers, fresh leaves, fresh leases on life…and, in step with a tradition dating back to around 2004–the year when Christian “values voters” reportedly seized our fragile nation’s helm–there’s also a fresh crop of new books unabashedly bashing evangelicals. As America turns harder to the Left, we are beset with stupidity, foolishness, outrageous lies, scandals, and endless political folly to our own detriment. We are become like the Melba toast European Socialists and strive to be more like them. Even today, presumptive Liberal Republican nominee John McCain has suggested that America “listen to the views and respect the collective will of our democratic allies”. I don’t know what could be more stupid. If we listened” to these “democratic allies” Mr. McDufus – we would NOT be in Iraq OR Afghanistan taking the war to the Jihadists. We would be cowering with one appeasement policy after another while we are turned into a Muslim state from within as it is in Europe. America has obviously lost it’s gonads as well as it’s brains and McCain might as well be John Kerry, Clinton or Obama, because they all state the same imbecillic nonsense in once capacity or another. Meanwhile, the country Americans love to denounce; France – has suddenly jumped into the realm of common sense that America has abandoned, in order to state what many of us already knew the day the bogus NIE report was released by the CIA last December. 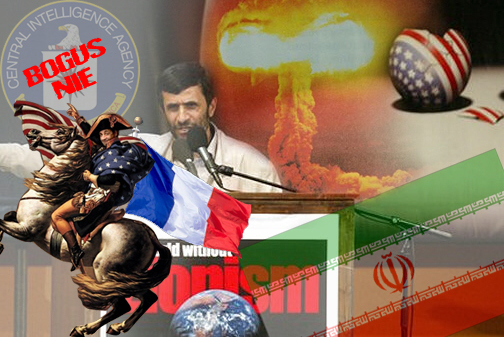 The French newspaper “Le Monde” says that it has documentation that Iran is still seeking to possess nuclear weapons and that last December’s NIW report that stated that Iran abandoned that quest – is bogus, and that it was a politically motivated report that did not give a true picture of the present nuclear program of the Islamic Republic of Iran. Duh. Those of us in America with a brain left already figured that out the day the bogus report was released. They say the documents detail discussions between top Iranian officials about their ongoing nuclear program. At the time the Security Council of UNO recently adopted a third series of sanctions intended to force Iran to stop his nuclear program, (Le Monde) had access to documents attesting that Teheran continued a military nuclear program after 2003, as opposed to what a report/ratio of the national direction of the American information affirmed, published on December 3, 2007. February 25, the assistant general manager of International Atomic Energy Agency (IAEA), the Finn Olli Heinonen, had presented evidence of the existence of this Iranian nuclear military program. A letter addressed during 2004 Gholam Reza Aghazadeh, to vice-president of the Organization of the atomic energy of Iran (AEOI), by engineer Mahdi Khaniki, one of the principal interlocutors of the IAEA and former ambassador of Iran in Syria, confirms its charges. This document draws up an inventory of fixtures of the relations between Teheran and the inspectors of the agency of Vienna. Mahdi Khaniki recalls in particular that the inspectors of the IAEA – who act under the direction of Mr. Heinonen – required to see the contracts relating to the acquisition of spare parts entering the development of the centrifugal machines. Assembled in “cascade”, these centrifugal machines make it possible to enrich uranium, possibly until obtaining a military quality. For the specialists in the Iranian file, this letter represents an obvious proof of the implication of the Iranian ministry for defense in the nuclear file. What consolidates the suspicions on the military character of this program, while attesting efforts of the Iranians to dissimulate nature of it. According to sources’ close to a service of information, this mail lies within the scope of the “Project 13”, whose heading is “project for the disappearance of the threats”. Given what Ahmadinejad’s rhetoric has been in the past, is “project for the disappearance of the threats” in reference to his call for the annihilation of Israel and the punishment of America? The intents of Iran are clearly made, and I’m amazed at the deliberate level of ignorance we wish to place on this problem as the shouts grow louder against any kind of military action against Iran. This project would have vocation to mislead the inspectors of the IAEA. The Research center in physics (PHRC) of Lavizan Shian was thus renamed “AMAD”, and its “departments” became “projects”, in order to scramble the tracks. In the second time, probably in 2006, name “AMAD” was also removed. Since, it is more made mention only of the “Center” to indicate the management of the military nuclear program. The American services of information collected, in mid-December 2006, a conversation between two not identified civils servant held with the ministry for defense in Teheran and making state of divergences between persons in charge for the AEOI and the ministry for defense. One of the two interlocutors refers to the “Center” and underlines: “the AEOI was occupied of its interests, and its policy was at 180 degrees of ours. Currently, as for the CTBTO (Organization of the treaty of complete prohibition of the nuclear tests), I think that the ministry of defense must have the last word, parce that they (leaders of the AEOI) know that with the end of the account we intend to lead tests.” The doubt remains on the nature of these “tests”, but this reference reinforces the suspicions. The information made public by Olli Heinonen, in February, in Vienna, contradicts a part of the conclusions of the report of the American services in December 2007. To explain this inconsistency, certain French diplomats evoke a “major dysfunction” within the American administration. Other sources advance that, during 2007, the American services of information, as well as the Pentagon, worried about the climate sabre-rattler which reigned then in Washington, and about the risk to see president George Bush opening a new military face against Iran. The purpose of the report/ratio of December would then have been to cross short to the temptation of the American executive to resort to the force. In other words, the purpose of the NIE report that was celebrated by every Democrat and mainstream media source in America, was to short circuit and circumvent any attack and war plans that were on the boards at the White House and Pentagon to deal with the Iranian nuclear threat. I would call that treason, but Americans no longer like that word, unless someone dares question Global Warming – then it’s treason. But to undermine the country in favor of those who are sworn to our destruction – is today called patriotism by those that have racist pastors asking for God to damn the country or claim they were shot at by snipers in Bosnia. Even the Treason Rag of Record, the New York Times is finding that it has to tapdance backwards on their celebration fo the NIE report they so loudly cheered and toasted. This confrontation is different from the long-running American-led campaign. Gone are the veiled threats of military action from the White House. The wind largely went out of that effort in December, when American intelligence officials surprised Western allies — and angered Bush administration hawks — with a report saying Iran had halted its nuclear weapons program in 2003. Ah, so this confrontation was different, because the French, with their savoir faire, their joi de vivre, their déja vu all over again, were at last convinced that Iran — which has a space program whose covert goal is to put into orbit satellites capable of dropping nuclear weapons on any city on earth, such as Paris — must be subjected to a higher level of inaction, such as the toothless additional sanctions the Security Council authorized this week. …But the NIE says Iran put an end to its secret nuclear weapons program, no? So “Tehran halted its nuclear weapons program” doesn’t mean “Tehran ended its nuclear weapons program.” It means the program was suspended. It inconceivable to me that the word “halted” wasn’t deliberately chosen as an alternative — misleading because of its ambiguity — to the unmistakably clear word that should have been used. The intelligence official(s) who signed off on using “halted” instead of “suspended” in that life-and-death sentence should be found and fired. Moderate confidence — I wish I had that much confidence in our intelligence agencies. ….The Times has found itself in a position where it needs to account for having neglected to report last December that — as to the intelligence community’s assessment of when our most virulent and implacable enemy will be able to make nuclear weapons — between the 2005 NIE and the 2007 NIE “basically nothing had changed.” Is the paper of record now pleading myopia? It will probably utilize the Hillary Clinton Method: “Those are what our memories of it are” defense and say they ‘mis-spoke’. Or…they can employ the Obama Defense and simply deny their assertions were ever made to the contrary, and then throw their reporters under the bus to join Obama’s grandmother. But actions speak louder than words, and France is acting on the belief that Iran is on the verge of nuclear weapons that it will use on it’s enemies. This has resulted in Tehran getting angry and issuing a warning to French President Sarkozy. I think that speaks to the truth of Iran’s ready-to-premiere nuclear weapons ability. Great essay by Erik Rush here. “We terminated the most precious American asset which vowed to defeat [the] mujahedeen.” – al Qaeda commander and spokesperson Mustafa Abu Al-Yazid, referencing the assassination of former Pakistani prime minister Benazir Bhutto; Adnkronos International News Service (AKI), December 27, 2007. Lest I wind up standing back-to-back with actor Will Smith tomorrow morning defending myself against flying produce (Smith is taller, so I might not fare too badly), I’ll insert the disclaimer here: My personal, moral and religious values preclude a belief that any ethnic group is inherently superior or inferior to any other. That being said, periodically I find it necessary and useful to state that such values do not preclude a belief that a particular culture might be inherently superior or inferior to another, and this is precisely the comparison I am making as regards Western culture versus the retrograde Indo-Arabic culture that spawns the mentality and social convention we glimpse in radical Islam. 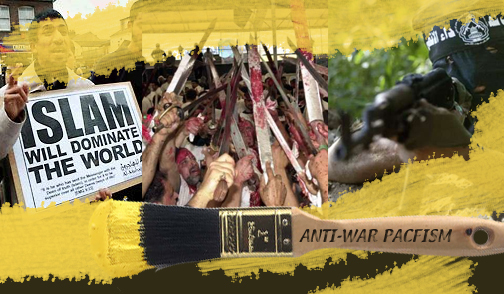 True, the West and Western-influenced cultures do produce our share of sick freaks, however one cannot compare the body counts generated by one Jeffrey Dahmer, Jim Jones or even Aum Shinrikyo to that of radical Islamists worldwide or the primal, inhuman barbarity that is the hallmark of so many of their atrocities. Islamic extremists around the globe are currently averaging one People’s Temple-sized massacre each month, according to a cross section of media outlets, both reputable and questionable. Benazir Bhutto, like many heads of state, particularly in the Third World, was no saint. Though definitely a cut far above her craven killers, this wasn’t Gandhi getting gunned down. In addition to the charges of corruption that plagued Bhutto during her tenure, the former Pakistani prime Minister was party to the repression of religious minorities in Pakistan. As is the case with many foreign politicos America has supported (and perhaps should not have), being an open advocate of cooperation with the West was Bhutto’s chief appeal. It was widely expected that her pro-Western stance would result in a government more cooperative and less duplicitous than that of the Pervez Musharraf regime. This brings us to the likely course that might have been taken by the Bush administration and whichever administration follows. Was the hope that Bhutto would have immediately allowed NATO forces into northern Pakistan to wipe out Taliban and Al-Qaeda operatives – as opposed to sucking another $10 billion in American taxpayers’ money out of the invertebrates in high office as did Musharraf? The scenario is indeed reminiscent of that in Egypt, where a “cooperative” Sadat replaced the anti-West, anti-Israel Gamal Abdel Nasser, with Bhutto being an avatar of the former. As long as the U.S. aid dollars kept flowing, Sadat was willing to come to the table with Israeli leaders. It bears mentioning that he too was gunned down for his political coziness with the West. America cannot bribe the whole world into “playing nice,” although many Western politicians and globalists think we can. If this sort of foreign policy strikes the reader as profoundly stupid, that’s because it is. For some reason, the West has a habit of employing such doctrines (profoundly stupid ones) in order to forestall clashes which seem inevitable to the lay observer, and which result in protracted global conflagrations (as opposed to transitory hostilities) as a result of inaction (or indecisive action) on the part of the West. Another key point that has been poorly analyzed by the press: “Radical Islam” is not monolithic. As evidenced in Iraq, sects not considered to be part of the global jihad have no compunction toward killing and persecuting one another. This is the way it has been in the Islamic world for centuries, and what we in America have to look forward to if we deny that elements of this religion are fundamentally incompatible with our culture, and therefore inassimilable. The aforementioned lack of decisiveness on the part of the West that has served to embolden these cultural ubermenschen has its roots in one place: The political Left. A cursory study of history is all that is required to confirm the rot which began with Karl Marx and spread to putrefy first Russia, then much of Europe and parts of Asia, Africa and South America. In the United States, the “struggle” to bring about a socialist or communist model of government has been ongoing since the days of the Bolsheviks and Jack Reed. The degradation of America’s cultural fiber, the advent of moral relativism and the Orwellian representations of the press and far-Left politicians have been initiated by design in order to further this end. As a result, Europe and the Americas have become overrun with intellectually pathetic milquetoasts, lambs for the slaughter by elitist secular-socialist gangsters in government. It’s ironic that a nation – ours – which used to be unashamedly Christian also used to be intelligent enough to take prudent action against its enemies, even when that meant the regrettable tragedies associated with collateral damage. Now, a U.S. soldier on active duty overseas cannot accidentally bump into a civilian at the bazaar without it appearing on the front page of The New York Times; we legitimize manifestly criminal organizations like The Council on American-Islamic Relations (CAIR), and are admonished by dull-normal entertainers to tolerate or even embrace our enemies’ point of view – regardless of the fact that our enemies have sworn to utterly destroy us and our way of life no matter what we say or do. The employment of this relativism in putting backward cultures on a par with America’s is ironic, an intellectually dishonest conceit and a dangerous example of false humility. Cavemen emerged from the caverns in which they had dwelt since the seventh century, and the culture shock melted their brains. Are we expected to abide and endure their unformed primitive social paradigms and their antisocial reactions to the world that passed them by? The answer: Only if we have hatred and bigotry rather than prudence in our hearts. If we objectively examine the extremes of our enemy’s philosophy, it simply comes down to an issue of self-preservation. The homeowner ought not be expected to pause and examine the motives of an armed home invader when he or she has the means to defend themselves, nor should the camper consider the legal ramifications of taking down the bear that’s about to rake his ribcage open with one swipe if he or she happens to have a rifle at the ready. The individual who believes America is not entitled to that – at least – is a damn fool. My suspicions ran rampant the moment the media began singing hosanna’s of the NIE’s report that became the darling story of the Defeat At All Cost Brigades. 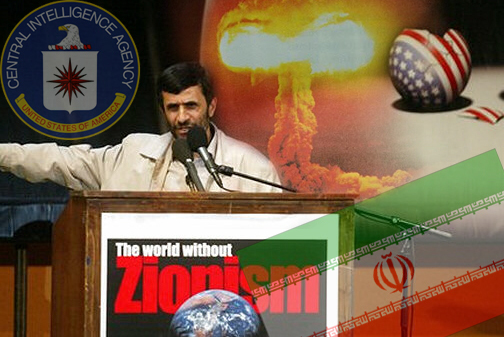 The news since Ahmadinejad’s first address to the UN in 2005, where he subsequently announced that he had a “divine” epiphany of destroying America while we sat helpless, has been one confirmation after another from his regime that Iran is on the fast-track to nuclear weapons status. As forthcoming and truthful as a CNN-hosted political debate, the NIE report has become the Hail Mary Pass for the Anti-war Left, who were screaming against any action against Iran’s nuclear program, or their madman’s proclamations of starting an Apocalypse to fulfill his nation’s supposed destiny in bringing back the 12th Imam. This carrot and stick approach has been the State Department’s preferred policy for the past 27 years, and has only strengthened the resolve of Iran’s leaders to continue defying the United States. Of course as Timmerman’s article points out – the Democrats and the Ron Paul and Anti-war brigades are giddy as a schoolgirl in Spring over the NIE report, which really serves the interests of Ahmadinejad and his quest for destroying the Great and Little Satan. Jihadists from Bin Laden to Ahmadinejad understand just as Vietnamese General Giap noted in his memoirs, that America’s defeat lies not on the battlefield, but in securing the defeat of America at home by the anti-war forces, and striking a killing blow upon our retreat. It would seem that the NIE operatives are willing to work with the Democrats and the Anti-war Left to serve that defeat up on a Silver platter if it means attaining political power, regardless of the costs we may endure down the road. At best the NIE is completely clueless and has absolutely no idea what is really going on inside Iran’s nuke program outside of what they hope, and at worst – they do not care. Iran could not wish for better freinds. If anything is clear from the new National Intelligence Estimate, it’s that the U.S. intelligence agencies have no clear idea of what’s going on in Iran. The authors of the intelligence estimate concede that despite their earlier conclusions they can’t really say how far Iran’s nuclear program has advanced, or how close Iran is to developing atomic weapons. It’s irrefutable that Iran may have a nuclear weapon in the foreseeable future — whether in 2009, 2013 or 2015 is not so clear. The only weapon the Democrats want to employ against our enemies in the Middle East is a white flag. Senate Majority Leader Harry Reid, as wobbly on Iran as on the Iraq war, says the Bush administration should be pushing for a “surge in diplomacy” with dealing with Iran. Mr. Reid, House Speaker Nancy Pelosi and other leading Democrats have a “can we talk?” message for the terrorists in Iraq — where Tehran, working through proxies, has been actively working to destabilize the country and kill and maim American soldiers. They’re eager to embarrass President Bush and denying sufficient funding to the military to do the job against al Qaeda terrorists for another year is the way they’re determined to embarrass him. Par for the course it would seem, with an intelligence apparatus that has become nothing more than a domestic political tool that our enemies have learned how to use against us by appealing to the selfish motives of power that our intel services are consumed with. After all, Congress and the Left have steadily worked for decades to undermine and deconstruct our military and intelligence capabilities. Democrats, with occasional exceptions, have spent a quarter century of undermining, mismanaging and debunking our military and our intelligence capabilities (including attempts to abolish the CIA) …no fair-minded person can ignore that on several critical fronts our intelligence was wrong and our decisions based on false assumptions and erroneous information. The Bush team has likewise been slow to deal with homeland security issues satisfactorily, most notably border issues. Much hay will continue to be made by the media and the Anti-war Left of this NIE report. But one has to ask, since this is the SAME NIE group that gave “High confidence” info of Iran’s threshold of attaining nuke capability in 2005 – with documented evidence that Tehran was “Much further along than we thought” – were they lying or mistaken then, or are they lying now? Remembering how shocked and surprised they all were when Pakistan and India suddenly tested nuclear bombs that our Intelligence had assumed were decades from being able to create – I can only assume from recent history that America will one day awaken to a similar suprise of Iran detonating a nuclear weapon, much sooner than we would have thought – and hopefully not from within an American or Israeli city. Given Ahmadinejad’s promises of a “world without America” and “Wiping Israel from the map” – such a hope may be nothing but a fool’s hope at best.